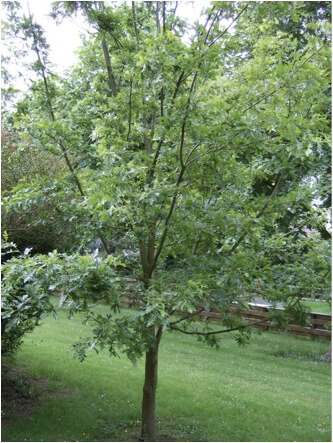 The Turkey Oak is a deciduous tree. The shape of each leaf usually has 5 lobes. The leaves, with narrow lobes and deep sinuses, resemble a turkey foot. The top of each leaf is a yellow-green and paler below. Turkey Oaks thrive in rich moist soils and full sun. They are frost tolerant. Use fallen leaves as mulch. Keep soil moist in Summer months.